Journal of Mathematics and Computer Science-JMCS (J. Math. Computer Sci.) is an international research journal devoted to the publication of significant articles in all areas and sub-areas of mathematics and computer science with applications. High visibility: Indexed in the Emerging Sources Citation Index - ESCI (Web of Science) from Vol. 15 (2015) and Scopus from Vol. 18 (2018). Submitted papers must be correct, original, nontrivial, and well written. Badly written papers will be automatically dismissed at the discretion of the editor in chief. All manuscripts are refereed under the same standards as those used by the finest-quality printed mathematical journals. J. Math. Computer Sci. is open access. ISRP acquires first-time, non-exclusive worldwide publication rights. 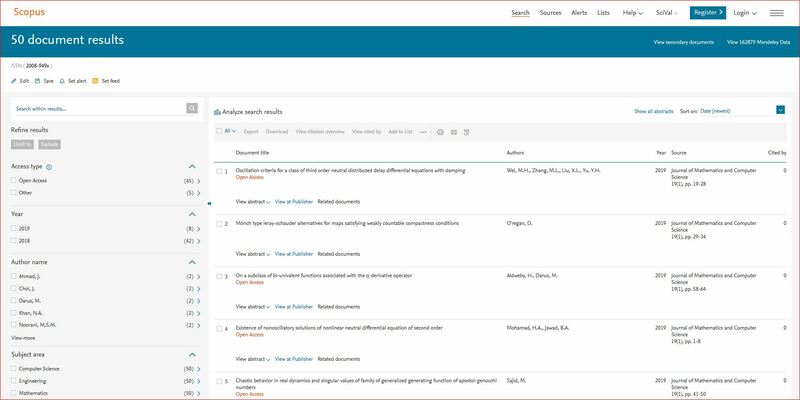 Offering academic researchers an open-access venue for publishing their work allows them to increase citations and establish their academic reputation in an increasingly competitive publishing environment. ISRP follows a stringent peer review policy. Each article is first evaluated by the editor-in-chief for the originality and scientific rigor of its research. If it passes this first test, the editor-in-chief assigns at least two peer reviewers, to determine whether it meets the rigorous scientific standards, whether it requires revisions or whether it should be rejected. Only original material that meets ISRP editorial standards will be published.